Japanese poster for "Seven Samurai"
“Seven Samurai” is definitive proof that it is not the story being told, but the execution of that story that creates compelling drama. 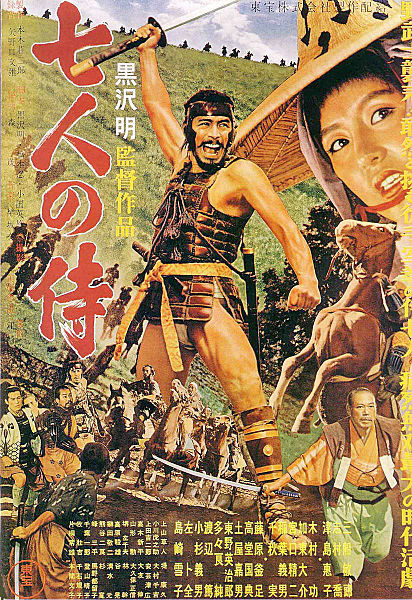 The film’s narrative is not what one would call ‘high-concept,’ nor even complex: A group of roving bandits are intent on raiding a sixteenth-century village, so the inhabitants decide to hire a team of Samurai to defend their Barley. That’s it. That’s all the synopsis one needs to understand what “Seven Samurai” is about, and though this story has been the core influence on countless imitators, from “The Magnificent Seven” all the way to “A Bug’s Life,” it’s not the modest plot, but the astonishingly profound way Kurosawa tells the story that makes “Seven Samurai” a masterpiece. It begins with Kurosawa’s mastery of what I believe to be the most important element of storytelling, let alone filmmaking: the characters. Without significant human touchstones – figures that fascinate, move, or inspire us – one cannot become invested in even the greatest of stories, and I think it is clear that the largest contributor to the film’s cherished status is its vast, deep, and entirely enthralling cast of characters. 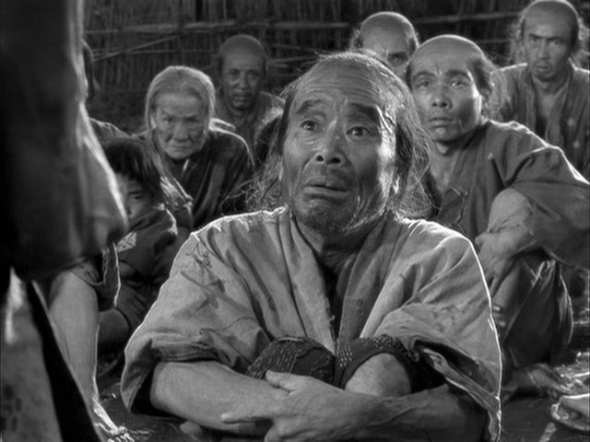 Forget the titular samurai for a moment, and consider what Kurosawa and the cast do with the villagers themselves. It is not easy to create characters that evoke the casual, circadian toil of everyday life, but from the opening moments, a subtle but powerful empathy for the peasants defines the viewer’s emotional attachment to the proceedings. 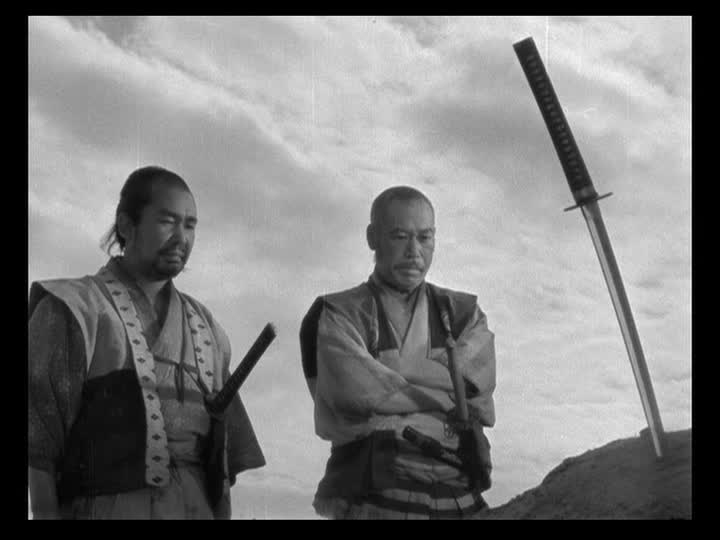 But of course, the Samurai cannot be forgotten, as they are, perhaps, the most compulsively watchable team of experts in cinematic history. 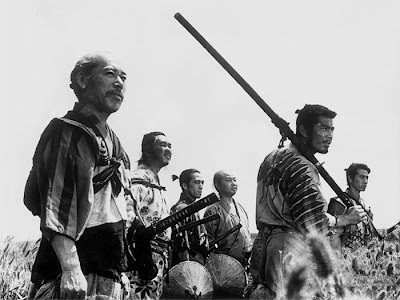 Kurosawa’s influence on the spaghetti western, the war epic, the action genre, “Star Wars,” and the like are well known, but I also imagine the modern heist flick wouldn’t be the same without the team dynamics pioneered in “Seven Samurai;” the appeal of films like “Ocean’s Eleven” lies in watching several large personalities plan and execute a risky undertaking together, and “Samurai,” of course, did that first. And Kambei is one hell of a hero. Played beautifully by longtime Kurosawa collaborator Takashi Shimura, he is my favorite of the Samurai, exuding grace, honesty, kindness, and a deadly strategic mind. He is such a quietly commanding character that he demands the viewer’s respect despite his fictional status. I’m sure every member of the group has been named the ‘favorite’ by one audience member or another – I could just as easily argue that Kyūzō is my favorite to watch if, for nothing else, the sequence in which he fearlessly rushes behind enemy lines to steal a musket – but Kikuchiyo is the most universally beloved, and for good reason. Kurosawa gave celebrated actor Toshirō Mifune free reign to do whatever he pleased with the character, and Mifune did the director proud by crafting a once-in-a-lifetime screen presence equal parts funny, tragic, and fierce. If the villagers are the heart and soul of “Seven Samurai,” Kikuchiyo and his many flaws and strengths is the spirit of the eponymous team itself, a concept immortalized in his symbolic triangle on the group’s flag. “Seven Samurai” is undoubtedly long – at 207 minutes, it outpaces most films an ordinary viewer will have seen – but few films use length to such great advantage. Though the film is an epic, I would argue it is not one of narrative scope, but of character; those 207 minutes are primarily devoted to learning everything we can about who these people are and how they interact, developing strong bonds between the cast and the audience. The level of investment we have in these characters by the time the climax rolls around would be impossible to achieve in a shorter film. That level of investment, in turn, fuels the string of awe-inspiring action sequences found in the film’s final hour. Though hundreds of films have used the language “Seven Samurai” created when staging their own set pieces, the power of “Samurai’s” action has not diluted one iota in the time since its release. The battles are brutal, captivating, and visually breathtaking, a testament not only to Kurosawa’s incredible staging – notice how he has Kambei literally use a map in planning the defense to help the viewer interpret spatial relations – but to the emotional connection we have to the outcome of each skirmish. Several of the biggest character payoffs come in the heat of battle, such as Yohei finally finding his courage when Kikuchiyo leaves him to defend the post, or when Kikuchiyo himself refuses to let a bullet to the stomach prevent him from cutting down the bandit leader. Action and character development have seldom been so inseparably mixed. The film’s technical merits are, of course, awe-inspiring at every turn. I have rarely encountered such gorgeous cinematography; each shot is perfectly and profoundly framed, from still, simple shots of characters conversing to long, complex takes where ongoing action is surveyed without a single edit. During Kikuchiyo’s final stand, Kurosawa keeps the camera a few feet away from the interior where the Samurai fights, but tracks along in tandem with Kikuchiyo’s movements, creating a hauntingly beautiful motion that is forever etched in my cinematic memory. It was a bit sadistic towards the cast to set the final battle in the pouring rain, but visually, the choice couldn’t have been better, as every image in that sequence is a treasure trove of compositional riches. The film makes such effective use of black-and-white throughout that I am sure it would be a lesser work had Kurosawa the resources to make it in color. 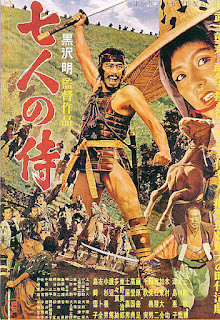 Fumio Hayasaka’s musical score is a character unto itself, softly punctuating the mounting dread or despair of certain scenes with a simple, pounding drum beat, accentuating the playful nature of Kikuchiyo’s character with an imaginative, fun motif, and using horns and regal patterns to underline the film’s exploration of honor. “Seven Samurai” is the exceedingly rare film that transcends the time and place it was made to suggest universal experiences of friendship, loyalty, fear, courage, and community. From beginning to end, there are characters, emotions, and visuals on display here that will move any viewer lucky enough to come in contact with the film. I immediately wished to re-watch the movie the first time I saw it, knowing my appreciation of the film’s riches would grow exponentially the more time I spent with it, and I suspect that eagerness will only expand the longer I keep “Seven Samurai” in my life. When one comes in contact with a film this accomplished, it underlines why one fell in love with cinema in the first place. “Seven Samurai” is, without a doubt, a testament to all the incredible things this medium can accomplish at its very best. Now it’s your turn: if you love “Seven Samurai,” sound off in the comments and tell me why. Favorite character? Favorite scene? Favorite speech? Get to typing! It's only right that you use the word "transcends" in your concluding paragraph, Jonathan, because that is precisely what "Seven Samurai" is -- transcendent -- and for the exact reason you so eloquently expound on: it's an action film that is driven almost exclusively by its characters. The action sequences -- great as they are -- are really only a small part of the story. 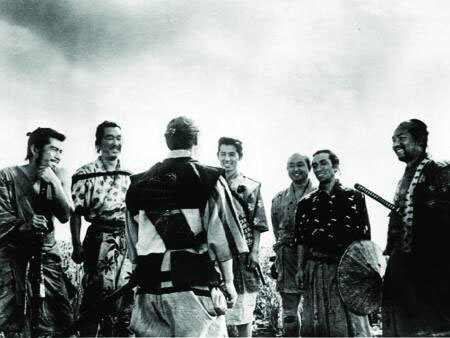 It's the interplay of personalities that truly powers "Seven Samurai." How many hundreds, if not thousands, of large-cast action films have fallen flat because they failed to take the time to explore the natures of the characters who populated them? Almost any Michael Bay film, for instance, leaps to mind here while, conversely, those that more thoroughly plumb the makeup of the players ("The Great Escape," "The Lord of the Rings," "Lawrence of Arabia" or even the American remake of "Seven Samurai," "The Magnificent Seven") linger fondly in memory. 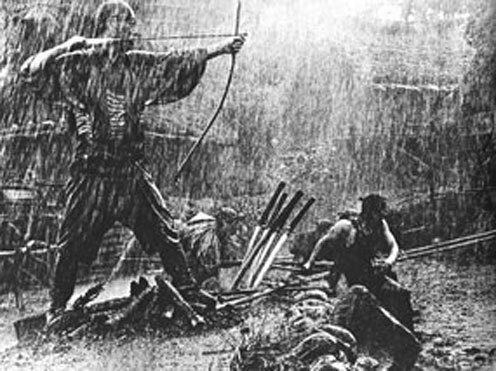 Jonathan and Steve, I agree with your praise of the well-drawn characters in Seven Samurai. With the amount of time spent with each character, the final action sequence was significant, with the action was not the sole reason for this movie to exist. Instead, Kurosawa gives us captivating characters and a setting that feels so real it's ridiculous, creating this setting by guiding us through a pedestrian but essential map of the town. I would have to say the final scene is my favorite. By using sparse dialogue to close the movie, Kurosawa demonstrates why he is so often cited as a filmmaker's filmmaker. The young samurai's wordless and physically simple actions is a complex story all its own, allowing for interpretation while avoiding meaningless ambiguity. Overall, an engrossing close for a film that absorbs you like hardly any other.